Bitcoin invented the crypto scene as we know it. Almost everyone would agree that bitcoin and the white paper behind it, is a work of genius. Yet we live it a cryptoworld swamped with crypto that is the antithesis of bitcoin and what distributed, consensus-based, proof of work, permission-less ledgers stand for. If a coin is not decentralized it is not part of the bitcoin vision. If it is a token, it has nothing to do with bitcoin. If you can’t mine it, its not part of the bitcoin dream. If you apply this logic to the top tables of crypto most now fall by the wayside. The top 100 is not only littered with crytpo that are not bitcoin-like; it is swamped with them. Strip out all the non-minable coins and suddenly many of the fancy claims of the crypto-community vanish to be replaced by a less hubristic scene. There aren’t that many pure cryptocurrencies out there. Now you might think the coin for an ICO for an antigravity device or equivalent should be worth half a billion--there are after all plenty of companies peddling similar shams on the stock exchanges of this world with chunky valuations, but let us put tokens, good or bad, in a different category. Then there are the non-minable coins, like penny pump and dump stocks, most are tightly held and traded to some theoretical value, like a fat worm on a hook awaiting gullible ‘investors.’ Let’s strip the coins of that ilk out too, legitimate or otherwise. What we have left are distributed ledger coins, minable by anyone, traded so the mining rewards can be sold for BTC and thus ‘fiat,’ with a blockchain not controlled by a central manipulating party. This is the kind of cryptocurrency that births a new industry. The top coin remains bitcoin with 64% of the market cap share of decentralized minable cryptocurrency. 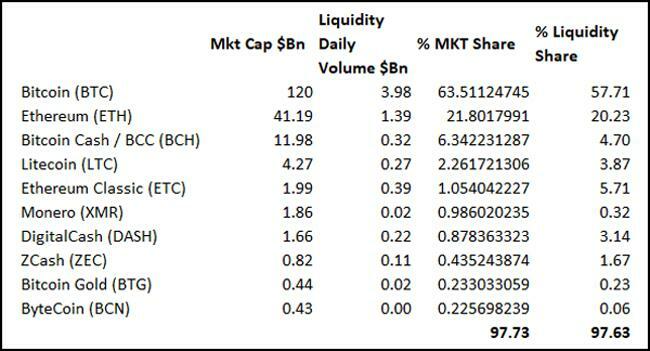 It has 57% of the dollar liquidity. Bitcoin is still dominant and without all the funky tokens and private coins, the flippening never happened and dominance is maintained. As you go down the chart the importance and liquidity of the coins quickly diminishes into irrelevance. This is an extreme 90/10 distribution. When this filter is applied, the market cap numbers ‘below the fold’ get small very quickly with the number 100 minable distributed coin boasting a modest $4 million market cap. With all the tokens and centralized coins rolled back in, the 100th crypto is worth three times more at $15 million. This bloat, especially by tokens, obscures the real picture of what is going on in the realm of bitcoin and cryptocurrencies. The upshot is that there will soon be a fork in the road for crypto. Tokens need to be looked at differently and evaluated and listed differently. We do this with stocks and bonds. You don’t want to see bonds listed in the same search and column as a stock. Likewise, the same goes for commodities. You don’t want gold to be listed under 'g' in your financial newspapers’ back pages. You want gold in a different section and the same goes for Forex. Tokens are securities, currencies are not; investors that can’t see the difference will come unstuck in the same way as investors in a ‘cold fusion’ ICO I had the dubious pleasure of coming across recently. I also feel that at least from an investment point of view, a clear distinction needs to be understood between cryptocoins with ‘distributed’ blockchains by design and the many undistributed ledger cryptos designed to be controlled by a company or a group of people. Distributed coins belong to maths and undistributed cryptocoins to man. That is a huge and defining schism. While neither style can win, one will dominate and that currently is bitcoin. This dichotomy, however it turns out, will shape the future of economics. Clem Chambers is the CEO of private investors Web siteADVFN.com and author of Be Rich, The Game in Wall Street and Trading Cryptocurrencies: A Beginner’s Guide. Next PostWhat Are Bitcoin Trading Bots?